The Station today is at St. Clement’s. The oldest level is thought to be the titulus Clementis, one of the first parish churches in Rome, and probably belonged to the family of Titus Flavius Clemens, consul and martyr and a contemporary of Pope St. Clement. Set right next to a pagan temple, a Mithraeum or Temple of Mithras, it was one of the first churches in Rome. This ancient church was transformed over the centuries from a private home and site of clandestine Christian worship in the first century to a grand public basilica by the 6th century, reflecting the emerging Roman Catholic Church‘s growing legitimacy and power. In the late 1st century AD, an insula (apartment building) and mansion were built here, separated by a narrow Roman street. These were built on top of earlier structures that were destroyed in the great fire of 64 AD under Nero. A Christian community is believed to have met in the mansion by the 2nd century. The community was known as the titulus Clementis, which according to custom was probably named for the owner of the mansion. Some believe this was the Roman consul and Christian martyr Titus Flavius Clemens (d. 215). In the early 3rd century, the inner courtyard of the insula was made into a Mithraeum, or Temple of Mithras. Mithras was a sun god of Persian origin whose cult was for men only and involved secret initiation rituals in small, cave-like structures. Some years later, a large hall was built over the inner courtyard and ground floor rooms of the adjoining mansion. It may have been built with the express purpose of housing the Christian community. Not long after Christian persecution ended under Constantine (313 AD) and Christianity became the official religion of the empire (380s AD), the hall became a full-fledged church. This is the lower church that can still be visited today. The existing hall was converted into a basilica under Pope Siricius (384-99), which is recorded on the dedicatory inscription to the left of the entrance. Changes included the addition of an apse, a narthex and an atrium, the blocking of openings in its sides, and the creation of a nave and two aisles by the addition of two colonnades. Increasing veneration of Clement of Rome (d. 99 AD and may be mentioned in Philippians 4:3), combined with the name of the titulus already meeting there, led to the dedication of the church to St. Clement. 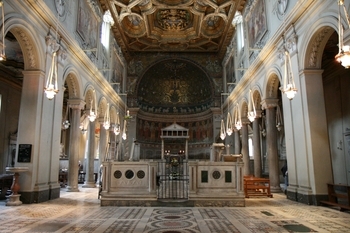 The Basilica of St. Clement hosted two papal councils in the 5th century. It was restored in the 6th, 8th, and 9th centuries; frescoes were added during each restoration. The church was badly damaged during the Norman sack of Rome in 1084. Even before the Normans arrived, though, it was located 5 meters below street level and not structurely safe. It was therefore abandoned and Pope Paschal II (1099-111 built a new church above it in 1108. The upper church of San Clemente was given to the Irish Dominicans, who were expelled from Britain, in 1677. The upper church was restored in the 18th century. Although the existence of the lower church was known, its remains lie untouched until the mid-19th-century, when the Irish Dominican Father Mullooly began excavations. Later priors of San Clemente further excavated the church and Roman buildings, but some parts have yet to be explored. The recent discovery of a 6th-century baptismal font indicates that there is still more to be found.